Hannah is my niece and is one year old today! 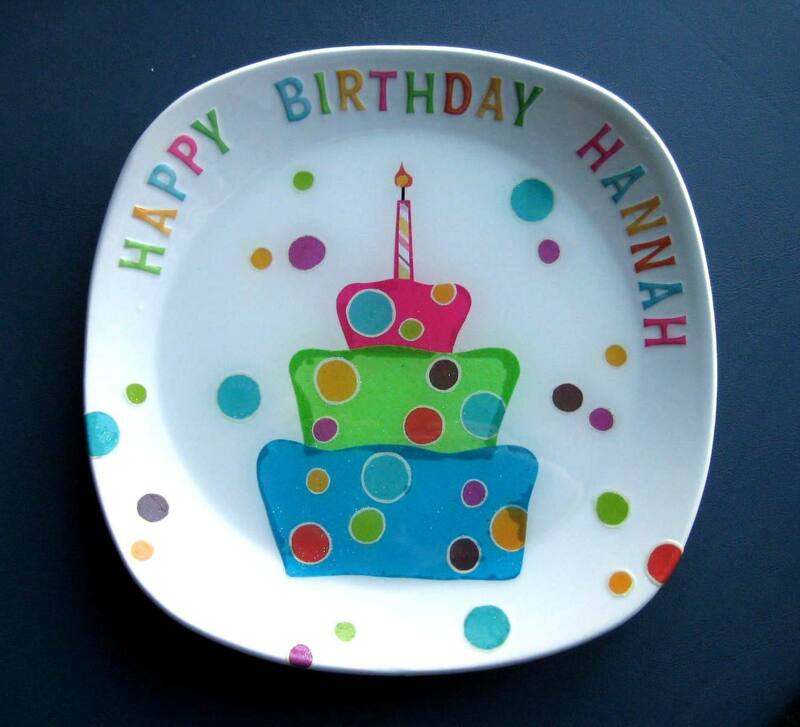 I made her a little Happy Birthday plate for her birthday party. It didn’t turn out the way I had hoped, but her mother liked it anyway. When I went to seal it, the sealant (is that a word???) ran under the cake and made it look funny. Oh well. Please don’t e-mail me asking me to do a plate for you 🙂 – this plate took me 9+ hours to make (and it sure doesn’t look 9 hours worth of cute!) and I will NOT be doing any more – got it :)?! Hannah, I love you girl! oh sandi….pleeeeeassse!!! just joking, i won’t ask you to make one, but i do really like it! what great colors and design. you continue to amaze me girl! love you! Thank you Susan – you are cracking me up! How about noooooooooooooooooooooooooooooooooo! Thanks for your constant encouragement! Love you! Thank you very much Linda, but NO you can’t order one – even if you did bring us a great meal when Grady was sick :)! I’m sticking to painting watercolor paper! Thank you for taking time to comment though Linda – I do love comments – they are so much fun! Oh, Sandi this is amazing! I love it! SO you’re making them is that what I hear? (jk). Did you see the pictures I sent you? Andrew wanted to make sure Grady saw that we skied “Rolex” for him. Thank you Audrey! Yes, I saw the pictures and they were great – it was a lot of fun looking at them! Grady got a BIG kick out of the “Rolex” run – he laughed his head off! Can’t wait to catch-up with yall tomorrow. I love this plate. I just wish I had time to do one for my great granddaughter who will be 5 on New Year’s Day. Maybe a little later. I sure don’t plan on spending 9 hours on one. It won’t look as cute either, but Jazzy won’t know the difference.